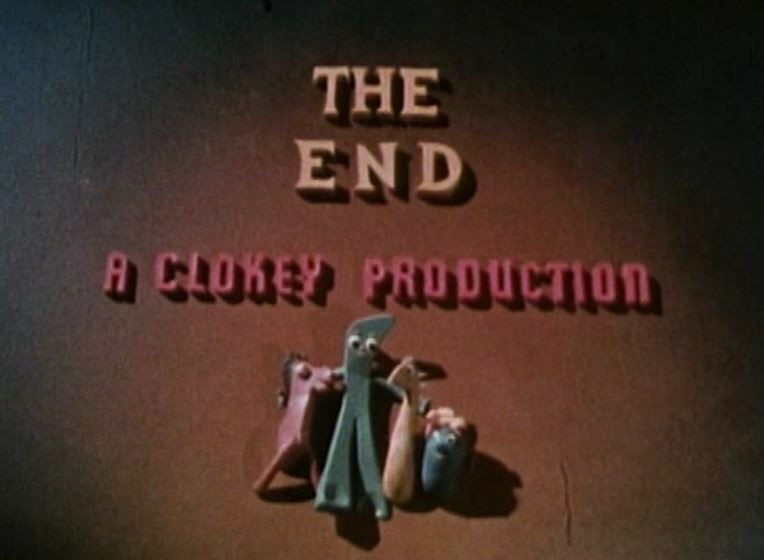 The 1960’s saw additional Gumby claymation cartoons being produced. 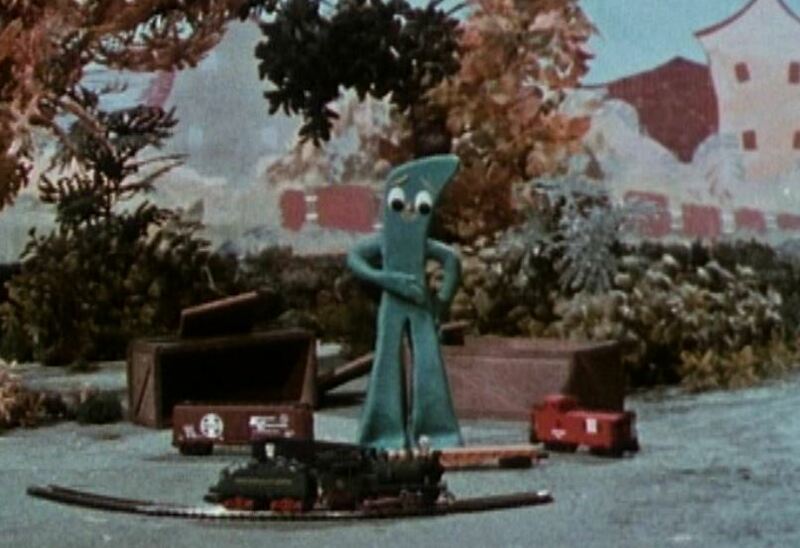 Similar to 1956’s Train Trouble (previously reviewed HERE on my blog), Tricky Train found Gumby receiving a half dozen crates each containing a piece of railroad rolling stock. 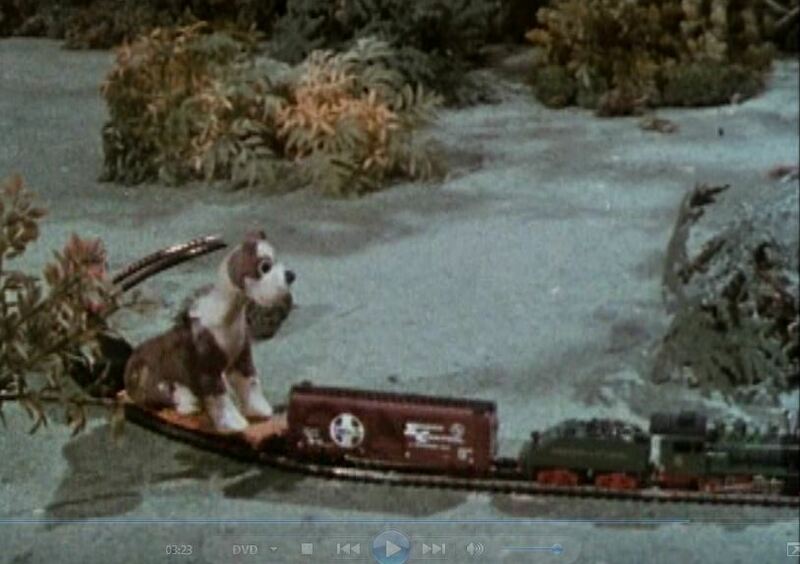 The consist was pulled by a little European-looking switch engine of unknown vintage. 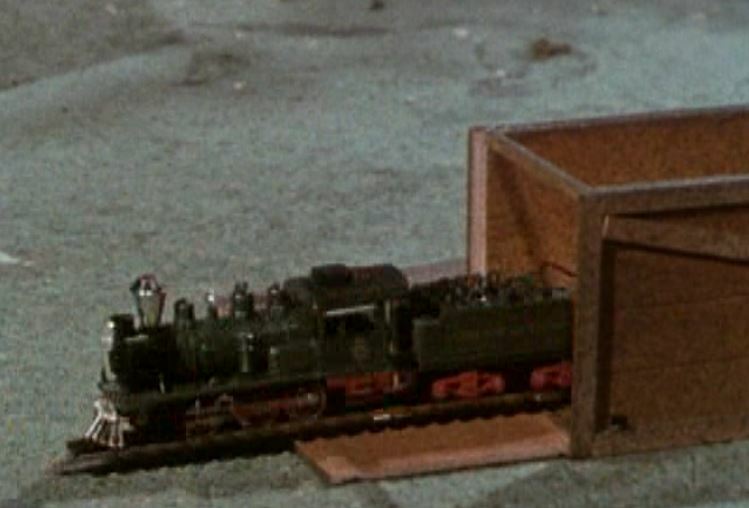 The whistle and sound effects were not as robust as in Train Trouble, but the train-making-its-own-track animation really moves things along. 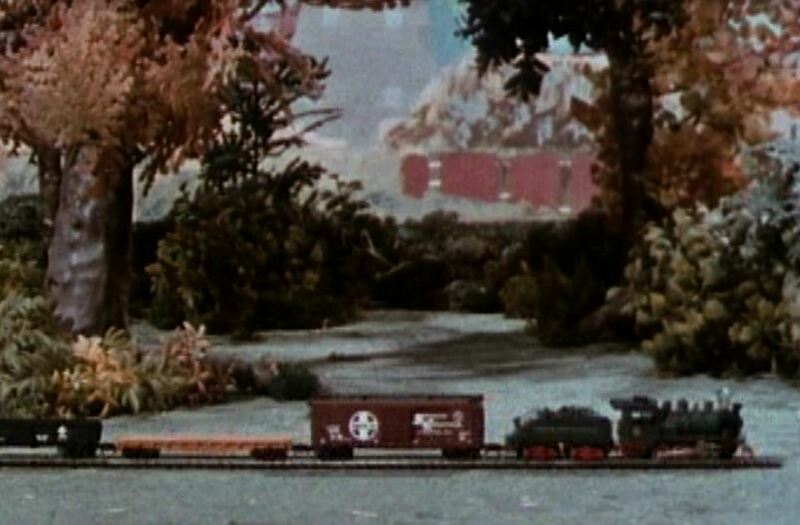 Once the picture gets rolling we see the complete train consist which is as follows: small steam switcher with either an 0-4-0 or 0-6-0 wheel arrangement, Santa Fe boxcar, yellow UP flat car, Erie gondola and AT&SF cupola caboose bringing up the markers. 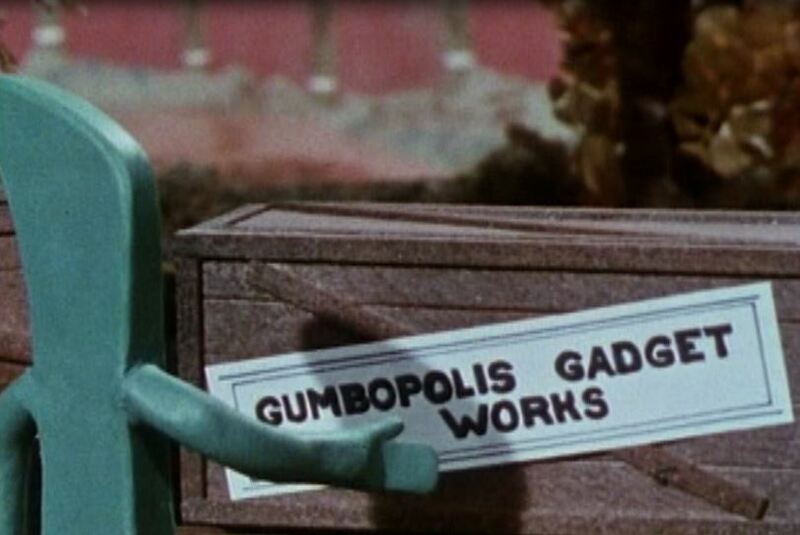 Gumby is delivered a bunch of crates from that well-known manufacturing firm, the “Gumbopolis Gadget Works”; Overhead view of the little steam engine banging back and forth inside its box. 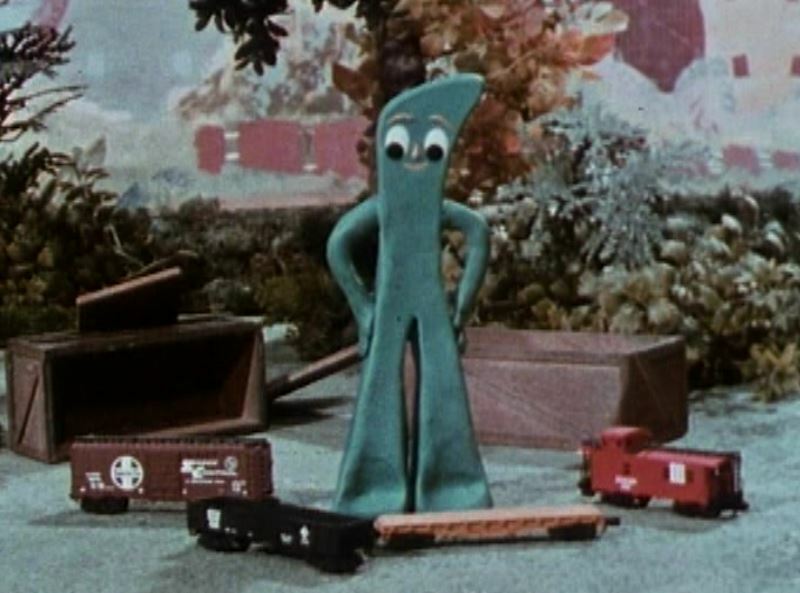 The trains arrived apparently unsolicited — Gumby looks surprised when he first sees them piled up in his front yard. The little switcher finally blasts out of its crate. 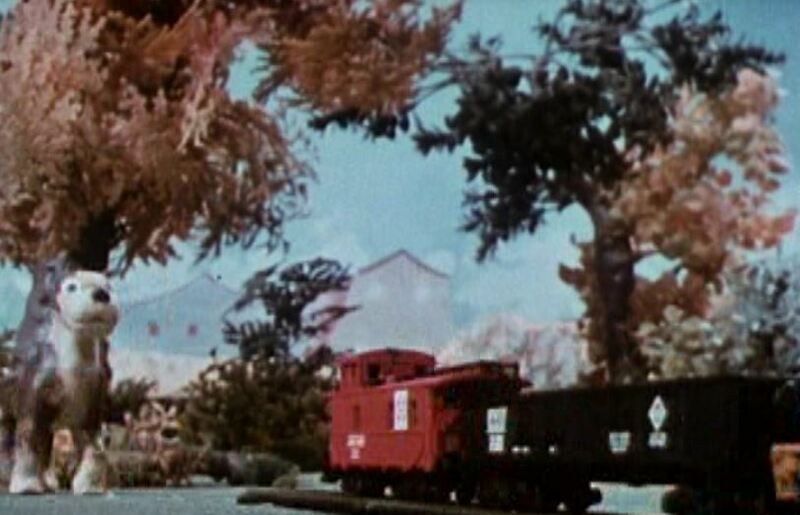 I think it says, “Western & Atlantic” on the tender; A bemused Gumby watches the engine making tracks in circles around him. 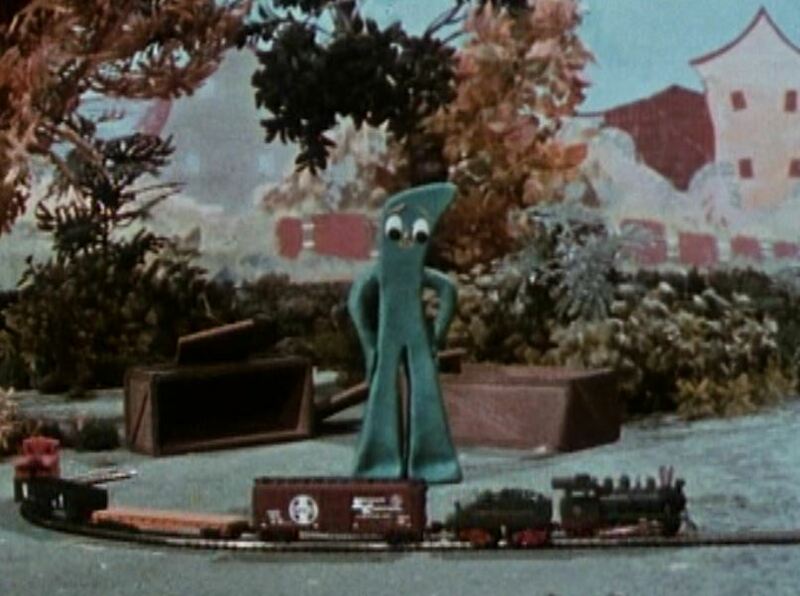 As the steamer circles Gumby, it picks up all its uncrated freight cars until it has a complete train; Gumby’s dog “Nopey” is in pursuit of the runaway freight. There’s that ATSF caboose again. 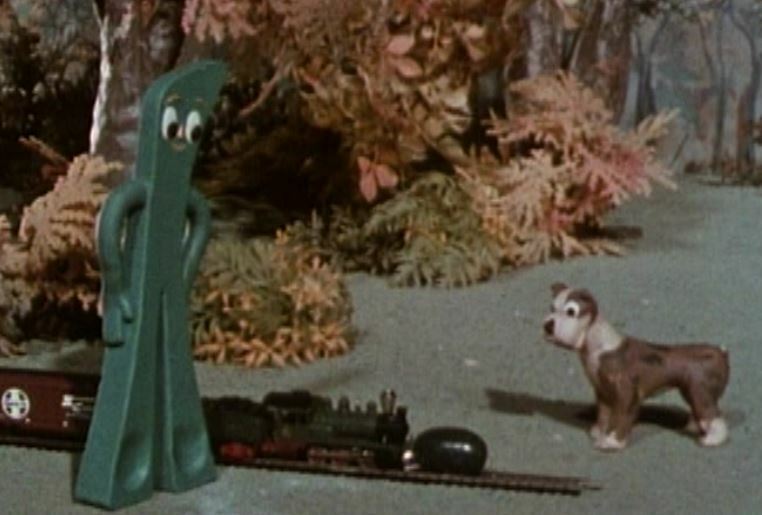 The freight train speeds along on self-laid tangent track; An entire view of the train chasing Gumby’s dog around a tree. 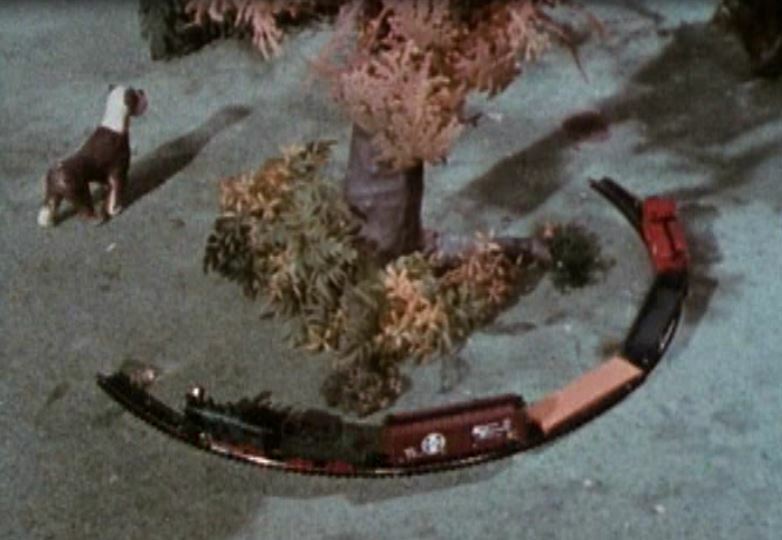 Nopey gets the right idea and hitches a ride on the Union Pacific flat car; Gumby finally stops the train (at least temporarily) with what appears to be a jelly bean. 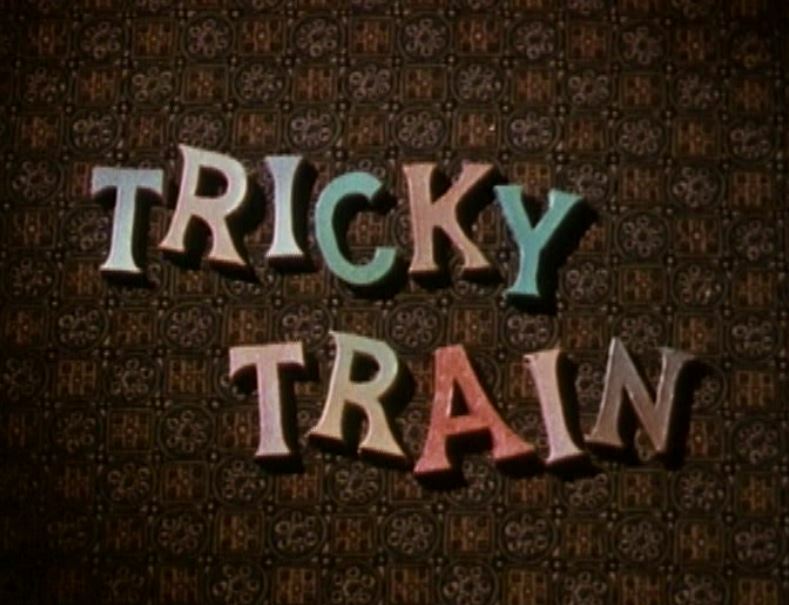 There are several other Gumby shorts that feature model trains, but Tricky Train (and Train Trouble) are the two that stick out in my mind. They are not exactly movies (running a little over 4 minutes a piece), but Obscure Trains they are indeed! 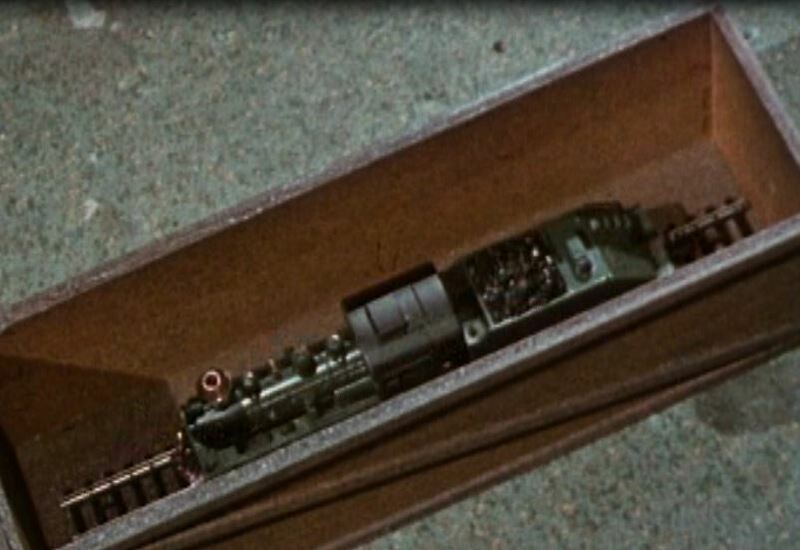 This entry was posted in Uncategorized and tagged Atchison Topeka and Santa Fe Railroad, Aurora Postage Stamp Trains, Claymation, Erie Railroad, Gumby, HO Scale, Model Railroad, N scale, Santa Fe Railway, Tricky Train 1964, Union Pacific Railroad. Bookmark the permalink. ALAS…I never saw that episode!